Decking kits come with Grade 305 stainless steel, star drive, 8 x 2-1/2″ plug fasteners. Flooring kits come with zinc plated, #2 square drive, 8 x 1-5/8″ plug fasteners. 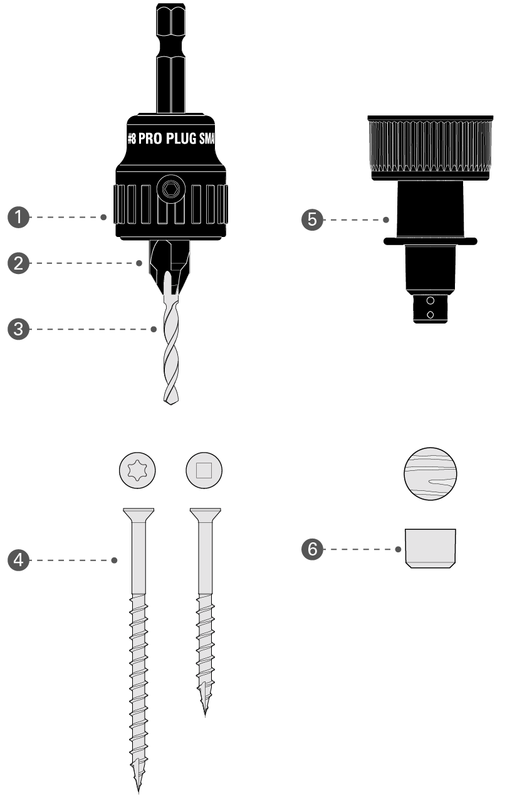 The patented Pro Plug Glue Nozzle is designed to apply standard wood glue to the sidewalls of the hole created by the Pro Plug Tool for Wood, in order to achieve maximum holding power. The Nozzle attaches to any interior or exterior 4 or 8 ounce bottle of Titebond® wood glue and any 4, 8 or 16 ounce bottle of Elmer’s® wood glue. Pro Plug Decking Kits come with Grade 305 stainless steel deck screws that are 2-1/2″ (63mm) long, for decking that is between 3/4″ (19mm) and 1-1/4″ (32mm) thick. Pro Plug Flooring Kits come with hardened steel zinc plated screws that are 1-5/8″ (41mm) long, for flooring that is 3/4″ (19mm) thick.